From one watery world to another, thanks to an obsession with clay. The island of San Giorgio Maggiore, Venice. 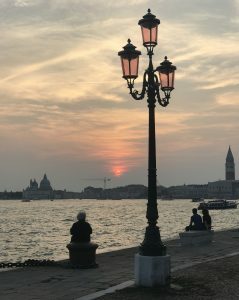 I am not long home from visiting Venice for the second time in my life. The first was 30 years ago with a friend from art school. I never forgot the experience. Silent waterways, Piazza San Marco flooded and empty, a gondolier singing to himself in the dark. This time I had more purpose in being there but nothing much seems to have changed. 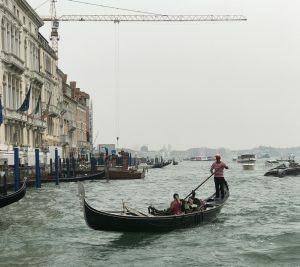 The back ways are silent of traffic noise, San Marco was flooded, this time with people and the gondoliers haven’t aged at all. My NPP* came with me and was as happy as an old salt can be surrounded by the sea and boats but still on dry land. I was there for the opening of an extraordinary show. 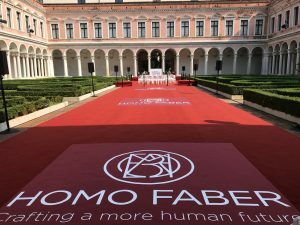 Homo Faber: crafting a more human future presented by the Michelangelo Foundation and staged on the beautiful island of San Giorgio Maggiore, 10 minutes by vaporetto across the water from the Doge’s palace. It is a huge event comprised of many different sections but all focused on one aim – to promote and highlight excellence in craftsmanship in making. Hands on skills. No 3-d printing here but long traditions of training in techniques passed down and developed through centuries from one maker to another. Much of the event celebrates the luxury end of the craft market where skill meets bling and costs are astronomical but don’t matter to those patronising the work. In one exhibit Homo Faber ‘shines a spotlight on the human hands behind the brands, offering visitors an unprecedented opportunity to see master artisans from twenty European luxury houses at work as they demonstrate the rare techniques and exceptional skills used to create products of the highest quality.’ Ferrari cars, a vintage yacht (happy old salty), handmade bicycles and customised Vespa scooters, haute couture, bespoke perfumery, handmade shoes, silk weaving, and on. Without this end of the market many of these unique skills of human hands would rapidly become obsolete and they are a joy. Talking to the bookbinders of Smythsons or an executive of Montblanc and the passion, enthusiasm and pride for the hands on skills of the makers was just the same. Best of Europe is a collection of contemporary work made by artist makers from all over Europe. 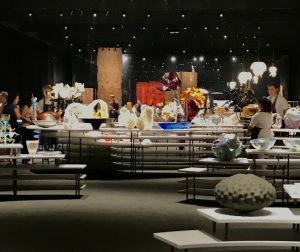 Curated by gallerist Jean Blanchaert and wonderfully displayed in an exhibit designed by Italian architect Stefano Boeri. It is described as ‘a tour of Europe through hundreds of examples of contemporary craftsmanship. Each object has been conceived and made by a single creative talent who draws on the traditional techniques and materials of their homeland to create contemporary works. Together, these fascinating objects paint a picture of Europe, reflecting the rich culture, history, landscape, knowledge and skills that make up this diverse continent’. The curator selected my work as a result of being at Collect2018 with Craft Scotland. Consequently, along with fellow Scottish makers Frances Priest and Amanda Simmons I found myself in arguably the most beautiful city in the world. Almost as unimaginable to me as Venice itself.